Optimal working dilutions should be determined experimentally by the investigator. Suggested starting dilutions are as follows: WB (1:500-1:2000), IHC-P (1:100-1:300), IF (1:200-1:1000), ELISA (1:10000). Not yet tested in other applications. Fig.1. Western Blot analysis of various cells using Rad52 Polyclonal Antibody. Fig.2. 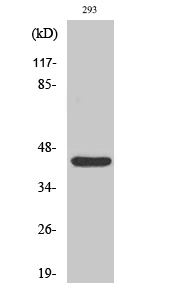 Western Blot analysis of 293 cells using Rad52 Polyclonal Antibody. RAD52 homolog, DNA repair protein encoded by RAD52 shares similarity with Saccharomyces cerevisiae Rad52, a protein important for DNA double-strand break repair and homologous recombination. RAD52 product was shown to bind single-stranded DNA ends, and mediate the DNA-DNA interaction necessary for the annealing of complementary DNA strands. It was also found to interact with DNA recombination protein RAD51, which suggested its role in RAD51 related DNA recombination and repair. A pseudogene of RAD52 is present on chromosome 2. Alternative splicing results in multiple transcript variants. Additional alternatively spliced transcript variants of RAD52 have been described, but their full-length nature is not known. Rad52 Polyclonal Antibody detects endogenous levels of Rad52 protein.